I’m not sure where the old saying “Don’t judge a man untilyou’ve walked a mile in his shoes” originated, but I can tell you that there isno advice better suited to describe Julie Otsuka’s The Buddha in the Attic thanthose time-honored words of wisdom. Written in first person plural, The Buddha in the Attic iseasily one of the most unique books I’ve ever read. It tells the story of a generation of Japanese women as theycome to America to pursue better lives with husbands they’ve never met. The entire book contains not a single line of dialogue, andthere is no main character. Rather, the main character is a collective population of firstgeneration Japanese Americans as they discover that the “better life” theysought in the United States simply was not available to them. Rather than reading like a traditional novel with plenty ofrich characters and a clearly defined plot, story climax and resolution, The Buddhain the Attic reads more like a long essay illustrating the collectiveexperiences and lack of equality of the Japanese immigrants in America. And yet, in spite of (or maybe becauseof) the writing style, I found the book strangely compelling and absolutelyfascinating. Though there was no one main character, the collective castof transient characters is so richly described that the reader has nodifficulty being drawn into the story and identifying with every single one ofthe faces whose lives and experiences are described within the pages. 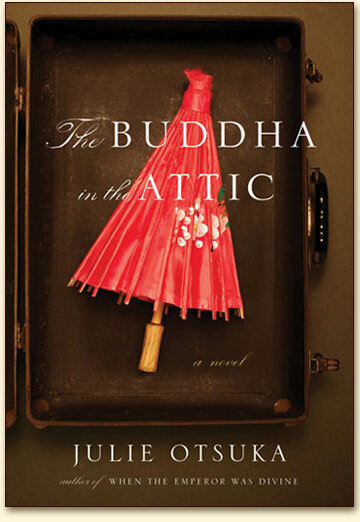 The Buddha in the Attic is a very short read and would be agreat choice for book clubs, as the story lends itself well to thought and discussion. Copies are available at the library instandard, e-book and audio book format. To learn more about this book, visit the author’s website at http://www.julieotsuka.com/. Sunday, October 30th at 2:00 p.m.
Join us on Sunday, October 30th at 2:00 pm in the library auditorium to meet author Mary Lethert Wingerd. Wingerd is an Associate Professor of History at St. 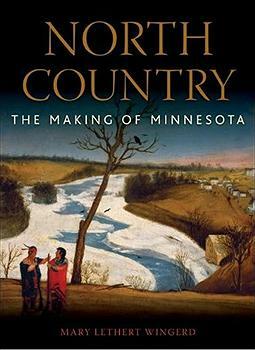 Cloud University, and is the author of North Country: The Making of Minnesota, as well Claiming the City: Politics, Faith and the Power of Place in St. Paul. Following the author presentation, there will be a walking tour of Indian Heights Park in Northwest Rochester. 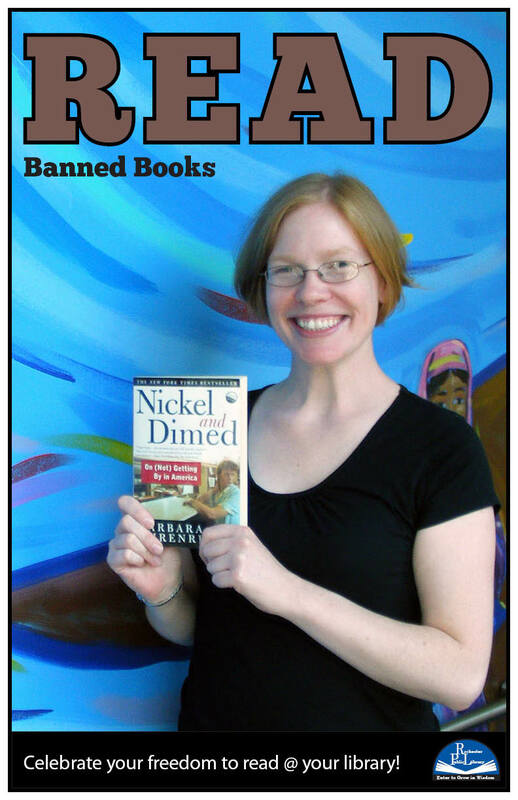 In celebration of Banned Books week, library staff posed for photos with the top ten challenged books of 2010. 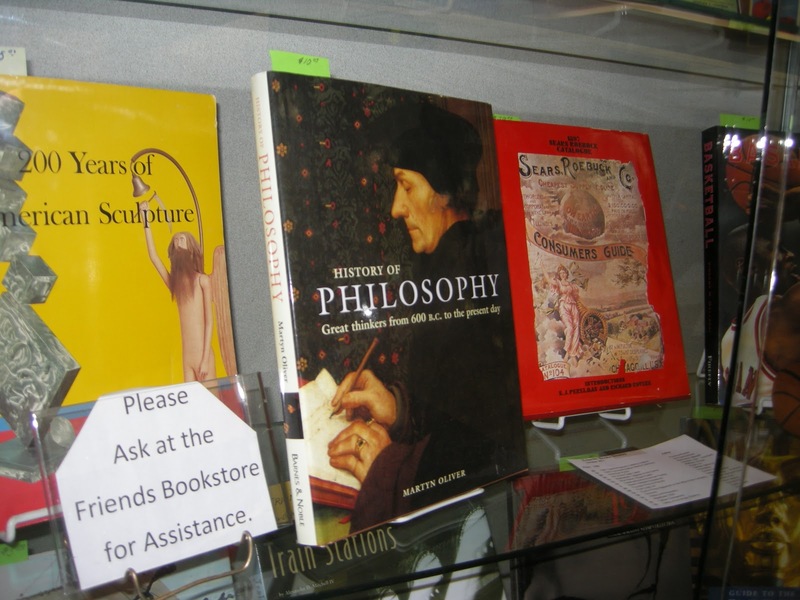 You can buy many of the banned books in the Friends’ Bookstore. Cathy Lamb is easily the most gifted storyteller I’ve encountered in all of my adult years of reading. She intuitively knows people, relationships and life experiences; and each of her many books pulls the reader in almost immediately with a story that not only catches the attention, but wraps the reader so tightly in the cocoon of the story that the reader begins to feel like a member of the main character’s intimate circle of friends. 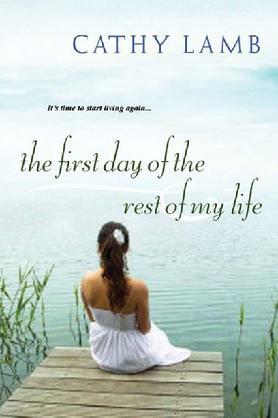 The First Day of the Rest of My Life is no exception, and is an example of a great author at her best. This book focuses on the lives of Madeline and Annie O’Shea, two adult sisters still learning to overcome the emotional damage of the most heinous crimes against children that anyone could ever imagine. They’ve grown up and become successful young women, but the abuse they suffered as children permeates every aspect of their daily lives. Given the premise of this book, one might think that the book is a gut-wrenching story about the abuse of two young girls, but it’s so much more than that! It’s a story about love; familial love, romantic love and the love of good friends. And, ultimately, it’s a story about owning your past so that you can take control of your future. Intertwined with the core of the story is a group of unforgettable characters and rich humor that only Cathy Lamb could bring to such a serious subject matter. Their mother, grandparents, childhood friends and adult acquaintances are people we all know – or wish we knew – and lend just enough humor to the story to keep the reader from suffocating in the terrible trauma that was Madeline and Annie’s lives. Beautifully written and a story that won’t soon be forgotten by the reader. To read more about The First Day of the Rest of My Life, follow this link. For more information about Cathy Lamb or to find a listing of her other amazing novels, visit her website at www.cathylamb.net. 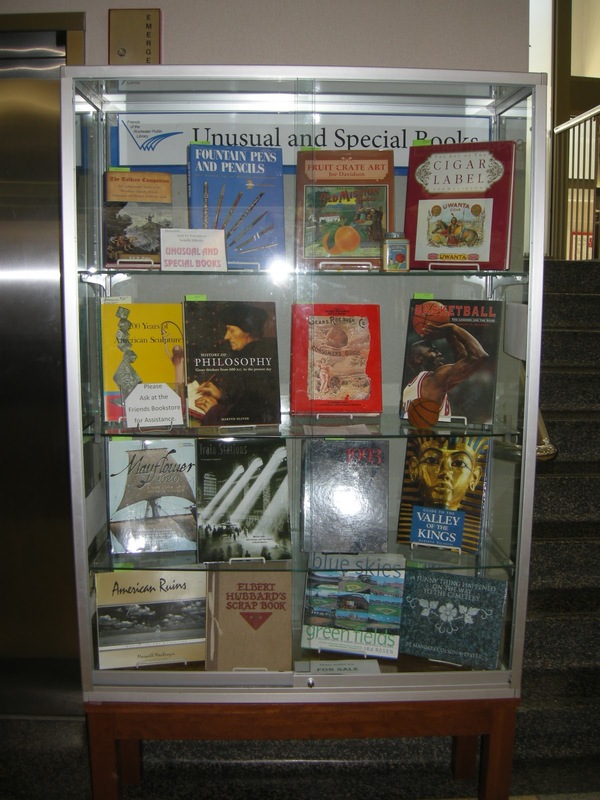 We have an amazing eclectic selection of older unusual and special books – come browse our display case and find a special gift. It is never too early to start thinking about that Christmas gift that has eluded you in the past! This display changes monthly so don’t miss out! It was almost two years ago that we received a phone call from a library requesting to have a mural for their children’s section. This would be our first library job, and we were thrilled. After creating murals in several day cares, dentist offices, activity centers, and homes, Greg was ready for the creativity and challenge that a library mural would offer. My name is Heidi Preslicka; my husband is Greg Preslicka, a Minnesota artist. 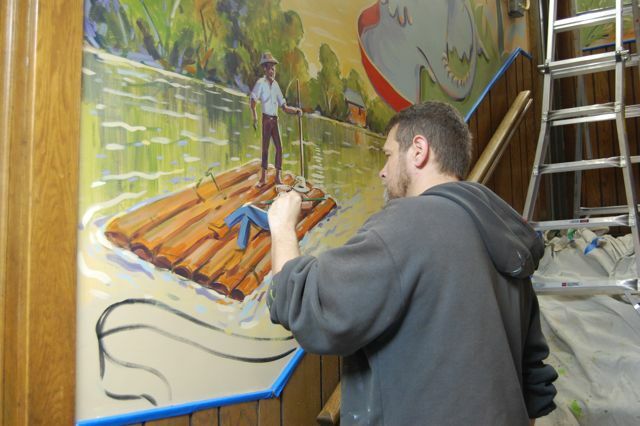 He creates large-scale wall murals that grace almost 50 rooms throughout Minnesota. We work together to run our small business. Greg creates the artwork, and I do the bookkeeping, marketing, and project management. For twenty years we have worked together in our graphic design studio in our home. However, three years ago, when the economy started to affect our business, we needed more work. We decided Greg should try painting wall murals in our children’s rooms. He has been doing art all his life, so this work wasn’t far off from his experience. The murals’ large-scale offered a new challenge for Greg. The murals turned out great and so, “The Big Picture” was born. Greg created a logo, a website, and I got to work marketing our business. Now, Greg enjoys the balance of working at his computer doing graphic design AND getting out of the office to do what he truly loves – painting. Now, over one third of our work is murals. 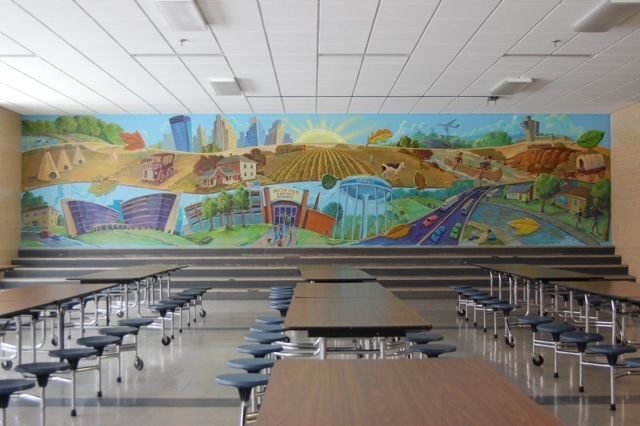 Murals can transform a space – whether it is an office, library, daycare, school, fitness studio, a bedroom, or a child’s play room. Murals bring a little bit more fun to a place that is already fun. Recently, Greg completed a large mural in the skyway connecting the Rochester Public Library and the parking ramp. Greg enjoys painting murals in libraries. Not only is he a huge fan of reading, but his job also requires him to keep his imagination flowing and reading helps this process. 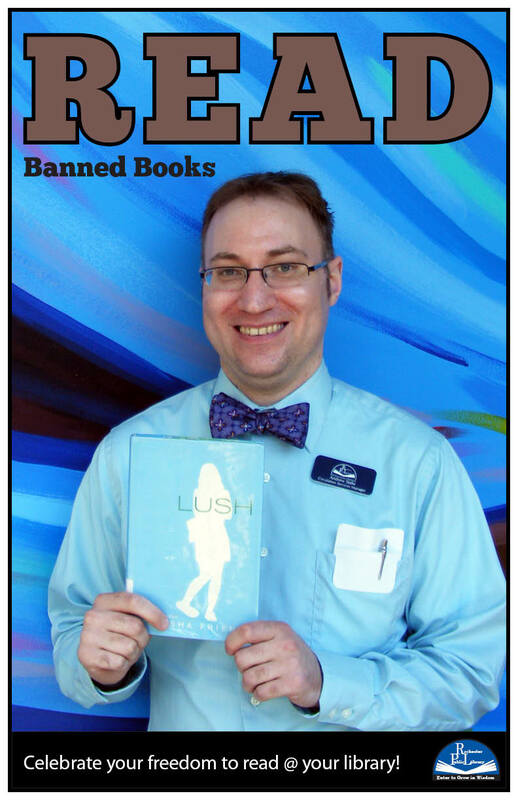 Greg enjoys children’s books, and he has even written and illustrated several books for our children. His favorite books are non-fiction, but he has recently been enjoying some fiction as well and has also been enjoying the library’s new audio book system. Since our first library job two years ago, Greg has brought his talent to many Minnesota libraries. A library is the perfect place for a mural; a place where you can enjoy a vast variety of information, learn a new hobby, and read stories. It is a place where your imagination can flow, a place to escape and enjoy. Libraries offer a chance to learn about almost anything in the world – all in one place. The decor in a library should reflect what a library has to offer, this being: history, culture, imagination, relaxation, beauty or a combination of these. Libraries have a similar look with the rows of shelving, but murals are a way to break up the monotony and provide a unique look, making it a more exciting place to venture into. 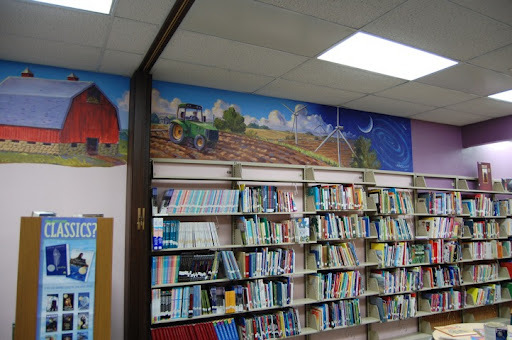 Children love libraries; and adding murals makes it even more special for children and adults. Greg’s murals give you a sense of being in another place. Libraries can take you away to another world with all they have to offer through reading. Greg’s murals do the same and add to this wonderment, whether the mural is of outer space, a tropical island, underwater world, a serene forest, or in the case of the Rochester Skyway mural – a view of the vast diversity within the town of Rochester. Murals are awe-inspiring and have generated a huge response within every town that Greg has worked. Greg feels honored to create a new work of art each time and he enjoys the process every step of the way. The process begins with meeting our client and discussing their vision. Sometimes our clients do not have a vision, but Greg walks them through these early steps and guides them into a direction they would like to go. After the first meeting Greg creates computer-generated layouts and with his computer, he super-imposes these images into photos of the space. With these images, the layouts appear as if the mural has already been created, giving our clients a chance to make the best choice for their space. Occasionally, our clients wish to see more and Greg will go back to the sketch-pad and computer. He wants our clients to love their mural and he’ll make changes to layouts until they are happy. Sometimes Greg works with a larger group of people. When working with a library board or a committee at a business there are many opinions and ideas that float around. Greg is able to work with a group and bring the discussion back to the goals of the mural and how those goals are going to be best achieved. He helps to guide the group to develop a design that is enjoyed by everyone. We have received many testimonials about the impact that the murals have had on the businesses we have worked with. It has been an overwhelming response. Those testimonials make this job even more fun. We hope you’ve been able to see the mural both in the skyway and in the children’s section of the Rochester Public Library. Thank you Rochester Public Library for supporting our business and for giving Greg the opportunity to contribute to the beautification of Rochester. Greg painted two murals in the Rochester Public Library – check out the photos on our Flickr account! Below is a small sample of other murals Greg has painted. Visit The Big Picture to see more of his work. The holidays are sneaking up on us, and what better way to get the ball rolling than with a craft class for kids! Kids between the ages of 10 and 18 are invited to join us for an afternoon of photo-related craft projects! Presented by Lynette Perry, kids will have the opportunity to learn new craft ideas using photographs, and will take their completed projects home with them at the end of the class! Admission is FREE and all supplies for this class will be provided by the library!